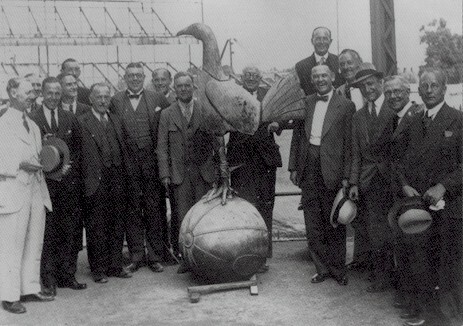 Do you know any fans who actively supported Spurs in the 1930s, 40s and 50s? Or are you one of those fans? If so, Martin Cloake and I would like to hear from you. I’m working with Martin on something that’s aiming to gather first hand memories of supporting the club from all those years ago. 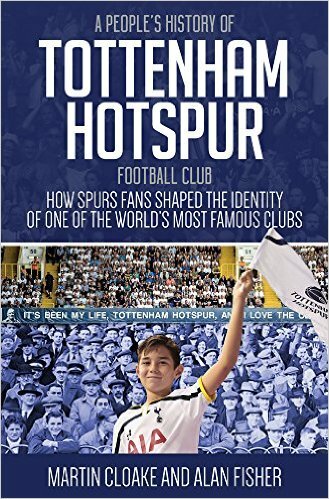 Martin is author and co-author of the essential library for every Spurs fan including with Adam Powley We Are Tottenham, the Glory Glory Nights and The Boys From White Hart Lane. We’re interested in the day to day experiences of being a fan, in what the club meant to people and symbolised in those days, in why it attracted the support it did, where from and how. And if there’s anyone who goes back further than the 1930s, we’d certainly like to hear from you. If you want to know more, please get in touch with me at tottenhamonmymind@gmx.co.uk or Martin on martincloake@mac.com we’ll get back to you as soon as we can. Next year will be my 50 th year as a season ticket holder in the east stand upper. Although my dad was a West ham supporter and we lived in Boleyn Road, Upton Park, my brother and I started supporting Spurs after seeing them giving an exhibition at the Festival of Britain in 1951 as First Division Champions. We had previous exposure to the Spurs but that exhibition display settled our support for life. CAN REMEMBER ARRIVING AT THE LANE AT 4PM FOR AN EVENING KICK OFF.ALSO THE POLICE ARRESTING TICKET TOUTS .LITTLE WHILE LATER A POLICE SARGENT WAS SEEN SELLING TICKETS.SAW SPURS V SOUTHAMPTON.SOUTHAMPTON FAN ASKED ME WHAT DOES GREAVES DO.I REPLIED HE ONLY TOUCHES THE BALL A FEW TIMES.JIMMY SCORED A HATRICK. I was born in 1951 and I think I was 9 or 10 when my dad first took me. I remember Terry Medwin on the touch line with a broken leg so that was my first season. My best mates dad took me and him to Arsenal a few times and I had older cousins who took me to West Ham now and then. There was nothing like that famous Tottenham roar when those flair players turned it on and I was sold hook line and sinker to those glory days. They’d already won the double, ( with a basic 11) then they bought Greavsie! What stars, elegant, intelligent players who battled and entertained for what was the same sort of money the supporters earned. Their job, I remember the wonderful Billy Nick drilling into them was to entertain the fans who’d spent their wages to pay theirs and that’s how it felt. Nothing like these over paid popinjays of today. I sound like my Dad! My Mum and Dad used to go when they were the famous Push and Run team in 1949/50.We ;lived in the High Road at the Cooperage business between Northumberland Park Road and the Edmonton border.I used to go to the play school in Park Lane and later St Pauls Infants which was/is some 80/90 feet away from the ground. However by 1958 we had moved to South Tottenham but Dad still used to go after finishing work at Saturday lunch time.After asking over and over again I was finally taken to my first game at the end of the 1959-60 season.Needles to say I never saw a great deal of the actual game but remember was were awarded a penalty and my Dad told me this was the proper way to take the penalty.Needless to say the great Cliff Jones proceeded to miss the penalty striking the cross bar before ‘scoring’ from that rebound.Quite correctly ( I of course did not know at the time) the referee disallowed the ‘goal’.Spurs lost the match and perhaps the championship that season – life as a Spurs supporter gives a great understanding of the real triumphs and disasters in life. Miss the bus to the ground ( never paid too packed),buying the cheap plastic player picture badges for my scarf,peanut sellers working their was around the ground,being very slightly ‘crushed’ as the crowd swayed with the match action – the smell of working men and their associated smells of beer and tobacco and the long walk home back to Broad Lane. Wish I could go more but I now live 90 mile away and find it too expensive.
! was born in 1946 in Dublin whlie my Dad was working in London. He had become a Spurs fan during WW2, because his first lodgings were in Tottenham. All the family have been Tottenham since. I was still in primary school when he brought me to my first match on his bike. That would have been before 1955. We didn’t come every week. Till 56/7 he was playing Saturdays and Sundays on Hackney Marshes. I grew up watching Jimmy O’Brien and his mates on the marshes and Ted Ditchburn and the rest at WHL. I can vaguely remember him pointing out Ron Burgess and saying he was the best player he’d ever seen. We both witnessed the arrival of Danny Blanchflower and Bill Nick’s first season as manager. Dad had seen the team that played in the regional wartime competition,the Div 2 squad winning consecutive league medals We were both present for all the London games in the seasons immediately before and after the Double and he maintained that Ron Burgess was the greatest ever. I think Bill Nick has said the same. Apart from the players and teams from the fifties I remember most were getting to the ground with Dad on the bike in good weather There were houses opposite the ground and you could leave the bike in people’s front hall. When you came by train you looked out for the tower of the LCS building after Bruce Grove. If the train was overcrowded we’d get off at Bruce Grove. The crowds were so dense for some matches we could walk quicker from the Grove than wading through the throng with a little kid from WHL. Dad was strict and he never tried it on, but the Boys turnstile was separate and sometimes 2 boys would squeeze through for the price of one. Then you could afford to buy peanuts inside the ground. A bloke with a speech impediment walked round the terraces callling out ”Peanuths, Peanuths”. I don’t remember anyone taking the mickey. If you were a bit late and the ground was already full men really did pass the kids over their heads down to the front. You had to stand on tip toe and a few little uns had boxes to stand on. Even when I was very little I didn’t always stand with Dad on the Shelf although that was our favourite spot, towards the front in the South corner. As I got a bit older and Bill started to assemble his first great team, matches got a bit one sided and some of us kids liked to see the goals going in for our side. So we’d get behind one goal in the first half and change ends at half time It was a bit of a sramble if we lost the toss and the opponents made the team change ends at the beginning of the match. The best playing memory has got to be the semi against Benfica. The Double Team plus Jimmy Greaves was undoubtedly the greatest line up I have witnessed at the Lane. The football that season was even better than the previous. We really did deserve to be the first British winners of the European Cup. We outplayed Benfica twice. I have met Les Allen, Ron Henry and Dave Mackay and we all agree, We woz robbed. I started watching Spurs in 1947 when Ron Burgess was captain and Bill Nicholson played I have wonderfall memories and the wonderful Arthur Rowe push and run side. I have been s spurs supporter for 60 years and have to say the way the board has gone about getting a top manager is disgraceful in the last 10 years it seems to all come down to money now the manager is so important and they think it is to say the lest a disgrace we go for the cheaper every time this time we have got to go for the best don’t mater what it cost we have excellent players they just need to be put into the right direction . we have gone backwards this last year .I must say I and a lot of my friends in my age group have found it difficult to watch us play this seasons we wasn’t a fan ( HR ) but he did get the players playing . WE can see we need a younger man but one that knows what his doing and have had some success to bring to us we must not get it wrong this time we must get it right at what ever cost .Or I fear for the club the club we love and followed all these years ??? My story with Spurs: ….Born about 10 miles as the crow flies from WHL, as a 10 year-old first went to a reserve game at the end of the double-season and was completely hooked, saw all the home games for the next 4 seasons, was scouted at 13 and played one glorious year there as a 13 year-old trained by Roger Hoy and -one unforgettable day- Terry Venables!……I was at school in Stamford Hill (up the road) and was made to play rugby (ugh!) on that field behind the Park Lane stand which the school owned – talk about torture!…..Greavsie was without doubt my main man…..I recall standing about 4 feet back behind the Paxton Road goal with that unique smell of linament and tobacco-smoke in the air and watching his pre-game ritual of chipping the ball from the six-yard box onto the junction of bar and post and have it return exactly to his foot where he’d repeat the process until he missed, usually a dozen or so times later…….anyone else remember that?…….Him and Gilly were unbelievable…..the first time Pat Jennings played I could see him shaking with nerves until he did that ‘one-handed catch’ trick and we all went berserk!…….Used to go to the reserve games and saw Stanley Mathews play for Stoke at the end of his career: as a mouthy 11 year old I got clipped round the ear-hole for loudly calling him a bald-headed old git (oh, the irony!!) by a Spurs fan who admonished me to ‘show some respect’ while the other Spurs fans tut-tutted their approval!……Definitely spoiled me for life as to the kind of football I love to watch and I hope we’ll get back to it soon….stopped going to the Lane when all that hooliganism-shite started……….Moved to the US and we started to get football on telly here about 15 years ago, so I was re-switched onto it and Spurs then…..now we get fantastic coverage of just about all the games and my 14 year old son – ( we run a small restaurant and Bill Nick’s daughter was in a couple of summers ago and struck up a conversation with us when she saw the shirt he was wearing!!) – is a yiddo like his old man! COYS! 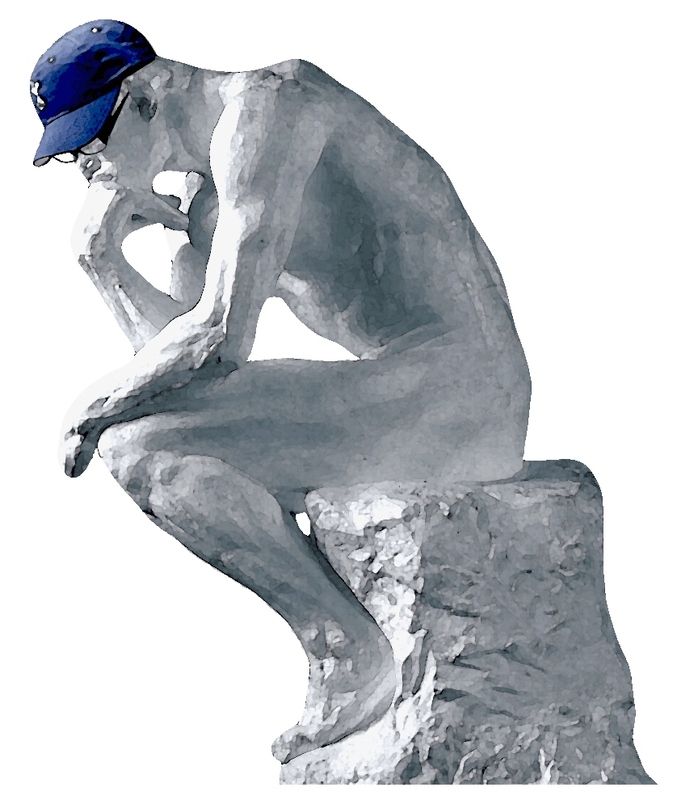 Hi Alan, hope all is well – and thanks for your enlightened thoughts this season – usually far more entetaining than what we all had just watched! My love-hate relationship with the place only goes back to 1964, although several years before my first WHL visit I recall my grandad (who was a taciturn old sod) getting animated during the 1961 cup final which I watched with him on his tiny TV. Wolstenholme reamarking that with Cliff Jones’s speed up the wing just a touch would send him flying. Pop then muttered something about this fatuous commentry, and used several words I never heard from him before or afterwards! He also told me about going to WHL in the thirties before lunch on Christmas Day, which I found hard to believe at the time. 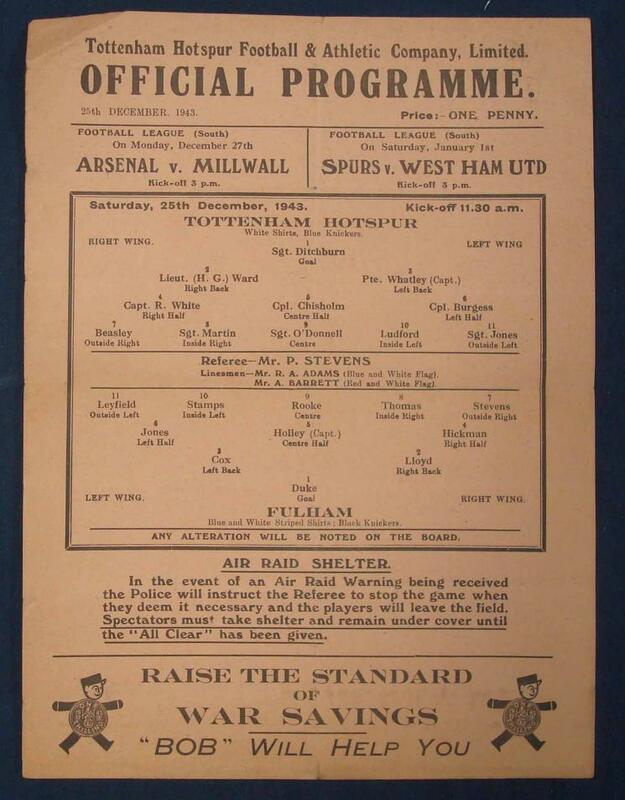 So I was fascinated that your programme image is dated 25 December 1945. And still with ARP warnings inserted – either the board were characteristically still worried about a sneak blitz seven month after the war ended or (more likely) they were just too mean to have the wartime printing plate amended. And a cute point – the only officer in the team warrants his initials, while numbers 7 and 10 must have been conshies or too young to serve! Earlier comments recall the surprisingly strong wafts of linament, beer and Woodbines, and the peanut sellers lobbing purchased bags with deadly accuracy to customers in the crowd. Good luck to you and Martin withe the book – and here’s hoping 2014-15 gives us quite a lot more to cheer! I love all the comments about what really were the ‘good old days’ for Spurs – my visits to WHL didn’t start until the late ’60s, but I lived very near the old Cheshunt training ground, so often saw the players coming and going in their very ordinary cars – Escorts and Capris, not Bentleys and Range Rovers! We knew that the summer holidays were near when pre-season training started in early July, and we’d see Eddie Baily riding his bike past our school playing field, leading a strung-out group of players jogging behind, the eager reserves (the likes of Pratt and Neighbour) close behind, while the old stagers (Greaves and Gilly) were always at the back! If I didn’t have those memories, I’d have no interest in Spurs 2014 at all, I’m sorry to say – overpaid, self-absorbed players, and a ‘game’ that’s about money and nothing else. P.S. ‘czyrko’ – a visit to the optician is required, because the programme is dated ‘1943’, not ‘1945’. Sorry. Chestnut (sic) – it’s only taken me 15 months to decipher your terrible hand writing! I can’t help being short-sighted… but at least I ain’t a feckin’ gooner!! Born in 1947 Went to my first Tottenham game in 1951 on 52 against Newcastle at the Lane. Then through my youth years and the lul in the mid fifties.We chopped and changed to old team at that time. Came to Canada for the summer of 57.met Danny and the boys as Tottenham played 2 games in Toronto. Went back. Bill became the manager. Was in the Old stand to watch the 10-4 against Everton and walked from school in Camden Town to Tottenham to see the Crewe game 13-2. Tommy Harmer from the old and John White from the new, both played together in that one. 59-60 we tied City at the lane at easter and lost the chance for the league. Saw every game home and away in 1960-61. It screwed my football life up.Have had similar expectations since. The absolute brilliance of Blanchflower and the tremendous intensity of Mackay,the floating deftness of White,the acrobatics of Jones and the support of the others were incredibly melded into a cohesive unit,a brilliant machine. Yes after there was cups,of course the European Cup winners cup…the highlite…..the Glory of all Glory Nights…. Levy must give him time to get the team playing his way and no interfearing from the board.We have had a bad season this time in my opinion we were challenging for the top 4 and then manager fired and then Sherwood and he started well but when he rucked the team on TV all my respect for him just vanished.I am waiting to see who the new manager is then we go on from there but I hope we can keep our top players like Lloris-Vertonghen-Eriksen-Siggy-and a couple of the others. I am SPURS through and through they run in my blood and through my veins. Born in Argyle Road, N17 just a few minutes’ walk from the Spurs ground and that was on a Saturday in December 1947 when Spurs were playing at home so the crowd cheering when we scored would have been among the first sounds I ever heard. My whole family supported Spurs and my dad took me to my first game when I was about five or six years old and sat me on a crossbar on the terrace and everyone made a great fuss over me. I remember my dad praising Tommy Harmer but not a lot else although the team would have included Billy Nick, Ted Ditchburn, Eddie Baily and many other great names and there were no goals scored on that day. I began to go to games around 1959, always standing right on the centre line at trhe fence where I made some wonderful friends. I watched the reserves on alternate Saturdays when Spurs played away and would often chat to John Hollowbread who had very little to do in goal back then. I went in via the Boys’ Entrance (well, there wasn’t one for girls so what was I supposed to do..?) I met some players, babysat for quite a few of them and went in to games via the adult turnstyles by the time I was 14 and socialised with some of them as I grew older. I still keep in touch with Cliff and Joan Jones. When I began work aged 16 I was able to afford to go to away games as well as home games. Now retired, living in Wales, I belong to Spurs sites and communities and follow my team from afar but am no less enthusiastic and loyal despite so many ups and downs over the years. I was incredibly fortunate to see the Double team and beyond play and to know the players and consider some of them friends. going to take us to the next level and Champions league heres hoping.